The species is distributed in South-eastern Europe, Southern Russia, Asia Minor, Iran, and Central Asia. Armenia is inhabited by subspecies M. a. kocaki Wagener & Gross, 1976, which occurs mostly in Central and Southern parts of the country, predominantly in the mountain steppes at the elevation range from 1000 to 2200 m a.s.l. The host plant of Freyer's Fritillary is Centaurea behen. The species gives one annual generation, and the butterflies are recorded on wing from late May till end of June, sometimes - early July. The species is slightly uncommon within typical habitat and shows stable population trend during 2003-2013 (p>0.05) although its abundance is lower in degraded habitats. Its host plant is not eatable for livestock and therefore is not directly removed from the habitat; probably that is the reason of its population stability in the mentioned ten-years period. It is though possible that the longer term trend can be different. The species is not included in the Global and National Red Lists, as well as in CITES and Bern Conventions, but it was evaluated for the European Red Book as Least Concern. 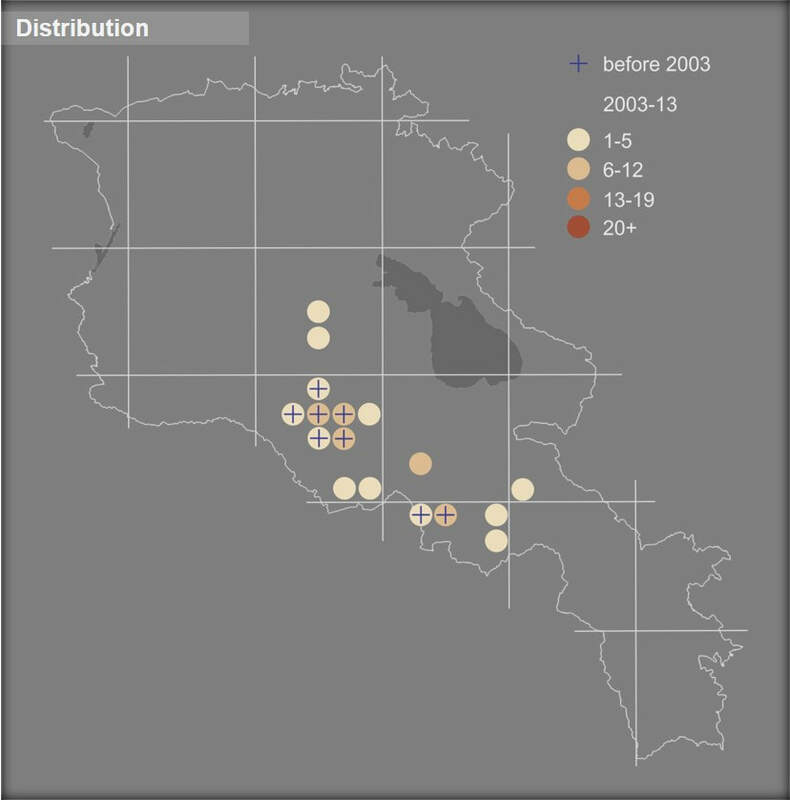 Preliminary evaluation of its conservation status for Armenia suggests the same, as some portion of its population occurs in Khosrov Forest State Reserve and Gnishik Protected Landscape. Also the Freyer's Fritillary is presented in Gnisheek, Ourtsadzor, and Geghadir Prime Butterfly Areas. The species doesn't need any specific conservation measures to be developed; however it is important to continue monitoring of its long-term trends. Also it should be noted, that the species is an important object for butterfly-watching and can plan an essential role in development of this branch of wildlife watching tourism.